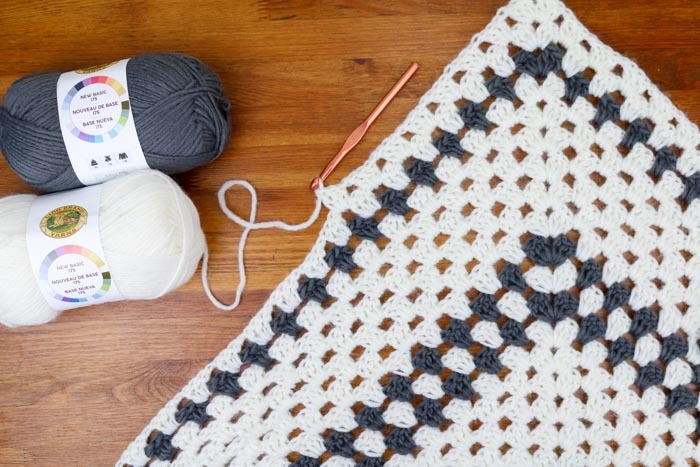 Newsprint Crochet Granny Stitch Shawl + Giveaway! 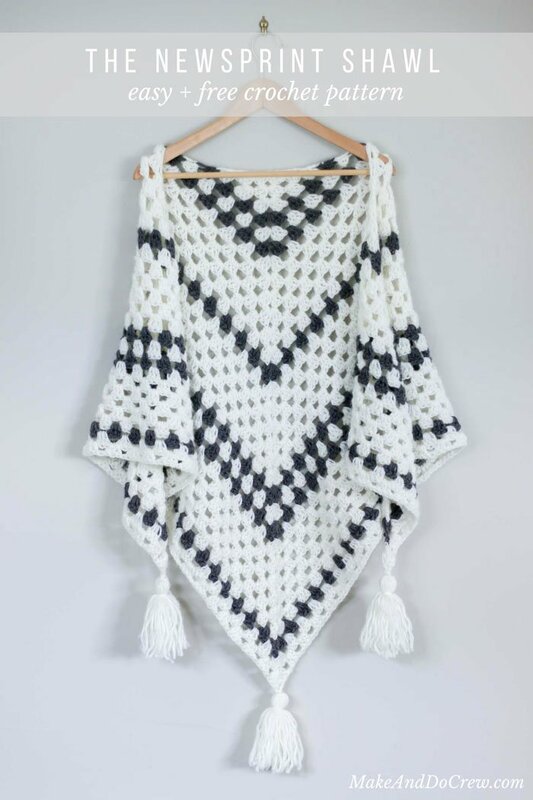 Put a modern spin on a crochet classic with this simple crochet granny stitch shawl! Find the full free pattern below or purchase the ad-free, printable PDF for $2.75 here. 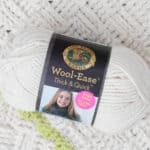 Scroll down to learn how to win a heap of free yarn from Lion Brand! 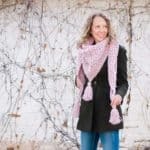 This simple crochet granny stitch shawl post is a collaboration with my friends at Lion Brand Yarn. This post contains affiliate links. As the oldest daughter in my family and one of the oldest cousins in my clan, I spent my childhood “leading” (ie. bossing) the younger kids into activities that suited my interests. I suppose that it’s that same desire to sit around with like-minded people and work on projects together that made me interested in starting a blog. (Which I mulled over for YEARS before I actually did it!) 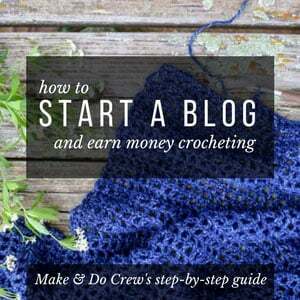 One of the things I never anticipated when I sheepishly launched Make & Do Crew though is how much the site and social media platforms we hang out on actually do feel like the crochet club of my childhood dreams. So today, I’m so excited to be participating in the Great Granny Blog-Hop with some of my favorite designers. 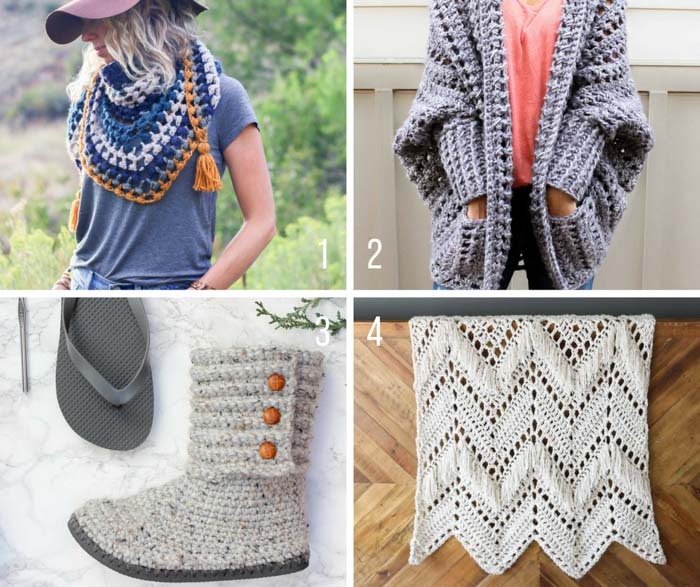 Led by Michele of Stitch and Hustle, each designer created a free crochet pattern using the granny stitch and together we’re sharing them with you today! 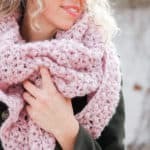 I would love for you to go check out each of these bloggers because I think you’ll find a deep well of crochet inspiration. 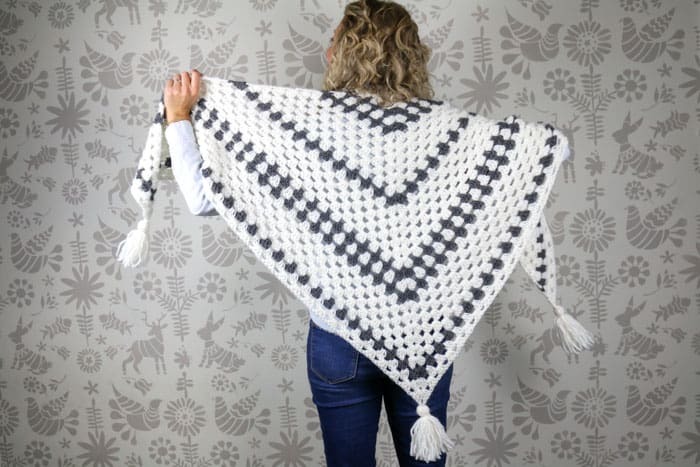 For my pattern for the Great Granny Blog Hop, I decided to design a granny stitch shawl that would be simple to work up and modern and neutral enough to wear all season long. I used Lion Brand New Basic 175 yarn for this Newsprint granny stitch shawl because I wanted the shawl to be able to feel full and cozy, without being cumbersome and heavy. New Basic 175 is basically like crocheting with that strand of white fluff that trails behind an airplane in the sky, so it was perfect for the job! 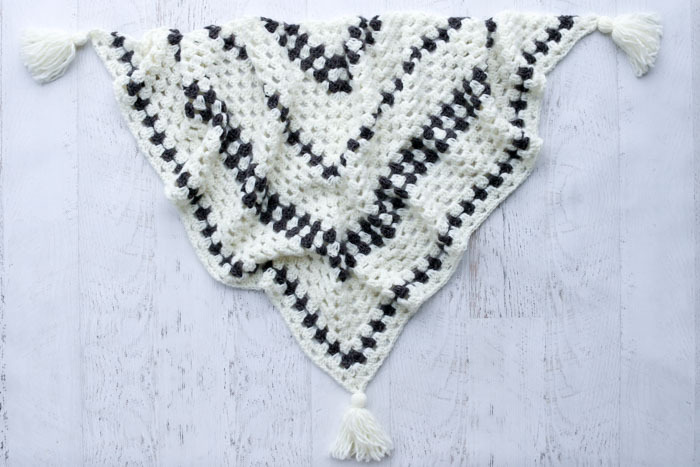 You’ll have this granny stitch shawl pattern memorized after a few rows at which point you can sit back, put on some Netflix, and daydream until you’re finished. Sounds like a perfect fall weekend to me. 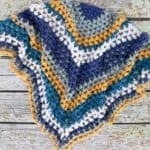 And if you just can’t get enough of the granny stitch, you might like to check out these other free crochet patterns I’ve designed. Now, the best part! 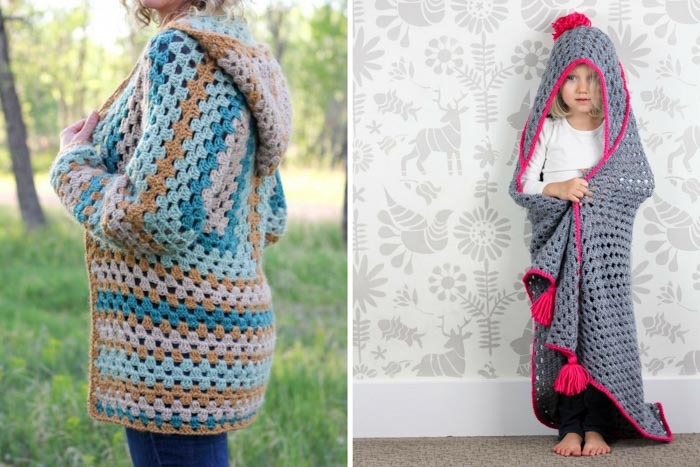 Lion Brand jumped on board as sponsor of the Great Granny Blog Hop and is giving one lucky winner the yarn to make the each of the six free granny stitch patterns! Seriously, how awesome is that? That’s enough yarn to keep you busy until 2018! The giveaway is open until Friday, September 29, 2017 at 11:59 EST. Scroll to the bottom of the post to enter! Good luck! Please do not re-publish this pattern as your own. You may make items to sell with this pattern. In exchange, please link back to this post. Do NOT use my photos as your own sales photos. ­­You can read my policies here. Now let’s make something awesome! Purchase the ad-free, printable PDF for $2.75 here. 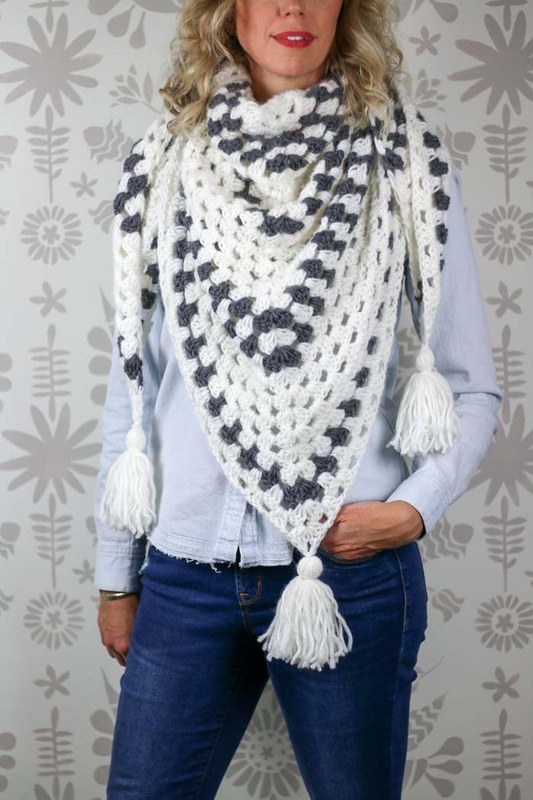 Explanation: The Newsprint granny stitch shawl uses rhythmic stripes to modernize this iconic crochet stitch. The resulting piece is light, super warm and can be worn around the shoulders as a shawl or around the neck as a triangle scarf. Add tassels or fringe to create a versatile statement piece you can wear all season long. You can easily adjust the size of the shawl by omitting or adding rows. • Ch 4 at the beginning of each row counts as one dc and one ch1sp. • The first and last granny clusters of each row should have four total stitches instead of three like the rest of the clusters. • To give your triangle a nice, straight edge at the top, work the first ch 4 and the last dc of each row loosely. • To change colors between rows, complete the final yo of the last dc of the row with the new color. Pattern is written with the assumption that the last dc before a color change will be worked this way. Base ring: Using MC, ch 4 and join with a sl st to first ch to form a ring. Row 1(RS): Ch 4, 3 dc in ring, ch 2, 3 dc in ring, ch 1, dc in ring; turn. Row 2: Ch 4, 3 dc in first ch1sp, ch 1, [3 dc, ch 2, 3 dc] in corner ch2sp, ch 1, [3 dc, ch 1, dc] in last ch1sp; turn. Row 3: Ch 4, 3 dc in first ch1sp, [ch 1, 3 dc] in next 1-ch sp, ch 1, [3 dc, ch 2, 3 dc] in corner ch2sp, [ch 1, 3 dc] in next 1-ch sp, ch 1, [3 dc, ch 1, dc] in last ch1sp; turn. Switch to AC at the end of Row 3 as described in the notes above. Work Row 4 in AC. Row 4: Ch 4, 3 dc in first ch1sp, [ch 1, 3 dc] in each 1-ch sp until corner, ch 1, [3 dc, ch 2, 3 dc] in corner ch2sp, [ch 1, 3 dc] in each 1-ch sp until one ch1sp remains, ch 1, [3 dc, ch 1, dc] in last ch1sp; turn. Repeat Row 4 (27) more times for a total of 31 rows, switching colors as described below. Using MC yarn and a cardboard toilet paper tube or a 4.5” piece of cardboard”, wrap yarn approximately 35 times around the tube lengthwise. Insert 10” strand of yarn underneath wrapped yarn on one end of the tube. Tie a few secure knots, but do not trim these pieces. 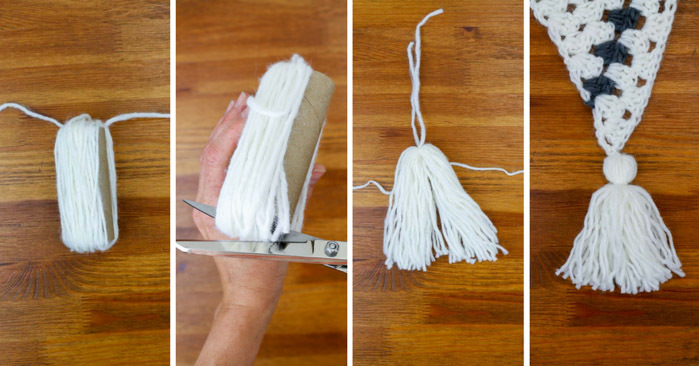 Use sharp scissors to cut the wrapped yarn at the other end of the tube. Fold the resulting strands of yarn in half and wrap a 10” piece of yarn around the top of the strands to create a small sphere of yarn. Tie this strand securely around the tassel. Use the tails from the first 10” piece of yarn to tie the tassel onto the corner of the scarf and weave in ends. Repeat twice more for two additional corners. 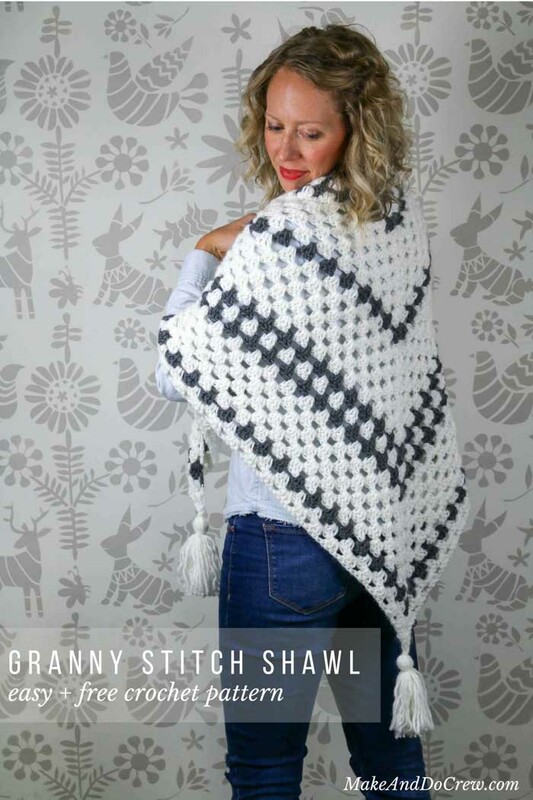 Let your new granny stitch shawl fall over your shoulders like a light snow and go make some hot cocoa! To enter the giveaway, please follow each of the six bloggers on one social media platform listed below. Gain additional entries by following the bloggers on multiple channels. You may share about the giveaway once each day to gain an additional bonus entry. Giveaway open to residents of the US and Canada only. Giveaway closes Friday, September 29, 2017 at 11:59pm EST. Good luck! cannot enter your contests because they require Instagram. I do not have a smart phone therefore I do not have Instagram NOT fair. I’m sorry to hear that Nancy. Our intention is definitely not to exclude non-smart-phone users. I may be wrong, but I think you can set up in Instagram account from your computer. I know I can login to mine on my computer. I’m not sure, but it might be worth checking out if you’d like to enter the contest. I love this and I’m making it for a friend’s birthday in October. I switched to an 8mm hook because mine looked super holey with a 10mm, but looks closer to yours now. I wanted to mention, on row 13 where you are outlining the color changes, it says row 12 again. Thanks for this great pattern! I’m working on the crochet shawl project and the top of my shawl is looking more pointed instead of straight across. ANy ideas why, I’m being very careful to crochet loosely. Is it pointing like it’s creating a diamond shape or more like a boomerang shape? Row 4 has me stumped! Is the “corner” the middle of my row?